Summary: From the #1 internationally bestselling author of The Sand Fish, Maha Gargash’s second novel is set in mid-1990s Dubai and Cairo and tells the story of how secrets and betrayals consume three members—an authoritarian father, a rebellious abandoned daughter, and a vulnerable niece—of a prominent Emirati family. Majed, the head of the eminent Naseemy family, is proud to have risen into the upper echelons of Emirati society. As one of the richest businessmen in Dubai, he’s used to being catered to and respected—never mind that he acquired his wealth by cheating his brother out of his own company and depriving his niece, Mariam, of her rights. My husband is probably cringing right now, but one of the reasons that I enjoy reading so much is that I can learn about other cultures. He would tell me to pick up some non-fiction books rather than reading so much fiction if I really wanted to learn; however, I am quite happy with reading a good story and learning a thing or two if I'm lucky! And that's why I picked up THAT OTHER ME by Maha Gargash. It sounded like a fascinating story about an Emirati family, and I know basically nothing about this culture. The description of the novel sounded interesting, and I do love a good family drama. For the most part, the book delivered on these fronts; however, I can't go so far as to say I loved it. THAT OTHER ME tells the story of the Naseemy family. The Naseemy family is extremely wealthy, and Majed, the patriarch, has found much success in the Dubai business world. Majed also happens to be a controlling (and often times nasty) man who has little respect for women... even (or especially) those in his family. The novel focuses on Majed, his illegitimate daughter Dalal, and his niece Mariam; and the story is told in alternating chapters through their voices. Dalal lives with her mother in a run down apartment as she tries to become a celebrity vocalist. Naturally, Majed doesn't approve of this career choice for her; and as she begins to discover some fame, he tries to thwart her efforts. Mariam, on the other hand, is a student in Egypt studying dentistry. She hate her uncle because she blames him for the death of her father, and she resents that her entire life is pretty much under is control. As both young women try to assert power over their own lives and ultimately challenge Majed's control, he becomes more and more frustrated and will to do whatever it takes to protect his family name. I enjoyed THAT OTHER ME and there were things about this novel that were very good. I found the cultural aspects of the story to be fascinating, and the family dynamics were pretty interesting as well. However, I still think something was missing from this novel and I can't really put my finger on it. All I can figure is that I didn't love any of the characters for much of the story. Of course, Majed was just a horrible man. He verbally abused his wife along with his niece and daughter, and I really didn't "enjoy" his chapters very much because I couldn't get over just how mean he was. His daughter Dalal was certainly determined to make a name for herself in the entertainment world; and while I appreciated her dedication, I really didn't feel much of anything for her. Mariam was probably the character I most liked of the three. She was definitely sympathetic given her story and what happened to her father, and I enjoyed seeing her mature despite her uncle and the setbacks she experienced. What's funny is that one of the more minor characters in the story, Majed's wife, was the character that I appreciated the most. I actually wish she would have been one of the main characters, with her own chapters, so I could have gotten to know her even better. It would have been interesting to hear from her about what is was like living in Majed and dealing with his controlling behavior. THAT OTHER ME would make a terrific book club selection. Unfortunately, I wasn't able to find discussion questions. The book is extremely interesting with its insight into another culture, and I do think most American readers will be intrigued by how different it is from ours. In addition, there are some very relevant issues in the story including marriage, fear, love, rules, expectations, sexuality, freedom, traditions, wealth, and the role of women. 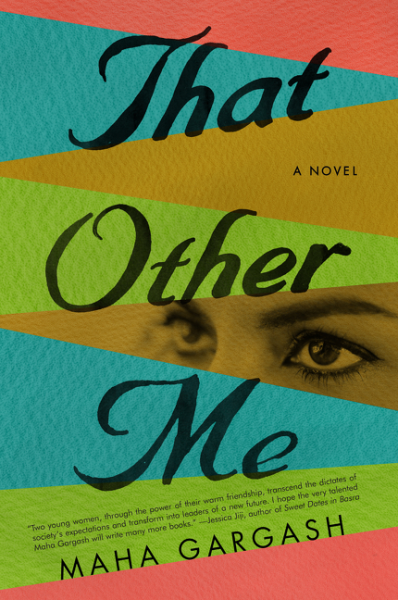 THAT OTHER ME is a very interesting story that allows readers to learn about another culture. I recommend it to those of you who enjoy family dramas. Thanks to Get Red PR for providing a review copy of this book. Hey, I pick up culture and history through fiction! This sounds good to me!